CANTON - Two modest schoolgirls living on a quiet cul-de-sac in this suburb are earning a reputation in the music world as gifted vocalists and kind of a big deal - even though they’d be the last to admit it. Olayeni spoke in the same quiet manner. “I like that with music you can sing anytime and you can make something up about how you are feeling that day; instead of saying it out loud, you can sing it. That’s more powerful,’’ she said. The sisters will sing at the Berklee Performance Center in Boston on Saturday as part of the Whittier Street Health Center’s annual international benefit concert hosted by Grammy award-winning gospel singer Bobby Jones. The girls will perform “Now I’m Free’’ and “Amen,’’ two original songs from their independent debut album, “The Mighty One,’’ released in May. Although the musical sister act is a relatively new phenomenon, Oladunni is no stranger to critical acclaim. About four years ago, she successfully auditioned for a singing role at a Boston Pops concert. Alves says he is pleased that Olayeni, who recently performed a duet with her sister at a Pops concert, is following suit. “That family may end up with two big stars,’’ he said. Since launching with the Pops, Oladunni has sung at Red Sox games at Fenway Park and Celtics matches at the TD Garden. She is also regularly invited to sing on Beacon Hill, said Senate President Therese Murray, who met the family a couple of years ago when Oladunni sang at a Boston Pops holiday concert. “Everyone there was so impressed by her voice and presence. I was blown away. There she was, standing on stage in Symphony Hall - this tiny little thing with this big, booming voice. She lifts you up with her,’’ Murray said. The sisters are both students at the Park School in Brookline. Seventh-grader Oladunni plays soccer, basketball, and track and field. She loves cooking shows and is considering a career as a chef. Olayeni, in fifth grade, plays field hockey, basketball, and lacrosse. She loves to sew and wants to be a fashion designer. The girls prefer to keep quiet about their success - even their classmates are left in the dark. “We don’t really like to brag, so we don’t tell our classmates when we perform,’’ said Oladunni. “I don’t think any of our school friends have seen us do a duet,’’ said Olayeni. The girls hail from a family known in the community as generous and devoted to Christian values. Olarewaju Oladipo, a successful orthopedic surgeon, is involved with charitable activities, including work with the Whittier Street Health Center. He and his wife, Yemi, both from West Africa, have five children, all daughters. “This is a musical family,’’ said Yemi Oladipo, who was executive producer for her daughters’ debut album, selecting tracks from more than 70 songs written by her two older daughters: Lami, 21, a senior at Harvard, and Olaitan, 19, a sophomore at Brown University. Even the youngest, Jubi, 6, played a role on the album; she sang backup vocals for a few songs. 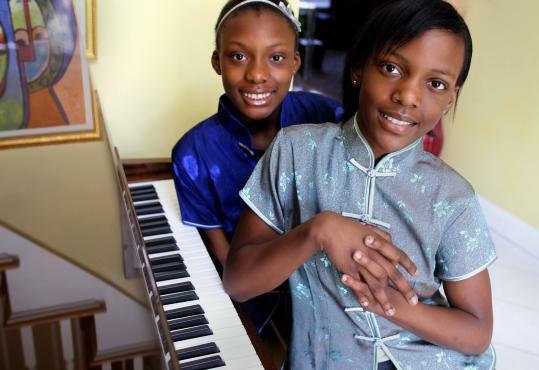 The two sisters have been invited to sing in the high-profile benefit concert for a third time, said Williams, describing them as strong role models for youth in the African-American community: two successful young singers balancing a performance career without losing track of important things such as academics and family life.